Foran Mining Corporation (TSX-V: FOM) is pleased to announce initial results from four holes of the ongoing summer resource definition drill program at its 100% owned McIlvenna Bay zinc-copper deposit in Saskatchewan. McIlvenna Bay is the largest undeveloped Volcanogenic Massive Sulphide deposit along the 225 kilometre Flin Flon Greenstone Belt. This world class metallogenic belt is host to 29 past and present producing mines, including Hudbay Minerals Inc.’s 777 and Lalor operations. The McIlvenna Bay deposit consists of several distinct zones of VMS mineralization, including massive to semi-massive sulphide in the Main Lens and Lens 3, and the underlying stockwork-style sulphide mineralization in the CSZ. The Main Lens at McIlvenna Bay is comprised of the zinc-rich Zone 2 and the copper-zinc bearing Upper West Zone (“UWZ”). Drilling was completed using NQ size diamond drill core and core was logged by employees of the Company. During the logging process, mineralized intersections were marked for sampling and given unique sample numbers. Sampled intervals were sawn in half using a diamond blade saw. One half of the sawn core was placed in a plastic bag with the sample tag and sealed, while the second half was returned to the core box for storage on site. Sample assays are being performed by TSL Laboratories Ltd. in Saskatoon, Saskatchewan. TSL is a CAN-P-1579, CAN-P-4E (ISO/IEC 17025:2005) accredited laboratory and independent of Foran. Analysis for Ag, Cu, Pb and Zn is performed using atomic absorption spectrometry (“AA”) after multi-acid digestion. Au analysis is completed by fire assay with AA finish. Any samples which return results greater than 1.0 g/t Au are re-run using gravimetric finish. A complete suite of QA/QC reference materials (standards, blanks and pulp duplicates) are included in each batch of samples processed by the laboratory. The results of the assaying of the QA/QC material included in each batch are tracked to ensure the integrity of the assay data. 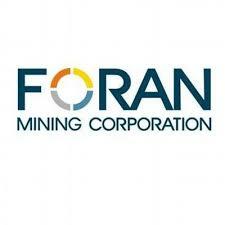 Foran is a zinc-copper exploration and development company with projects located along the Flin Flon Greenstone Belt. The McIlvenna Bay Project, Foran’s flagship asset located within the Hanson Lake District, is part of this world class VMS belt that extends from Snow Lake, Manitoba, through Flin Flon to Foran’s ground in eastern Saskatchewan, a distance of over 225 kilometres and just 65 kilometres from Flin Flon. McIlvenna Bay is one of the largest undeveloped VMS deposits in Canada. The Company is currently conducting a resource definition and infill drilling program in preparation for producing a feasibility study on the McIlvenna Bay deposit.